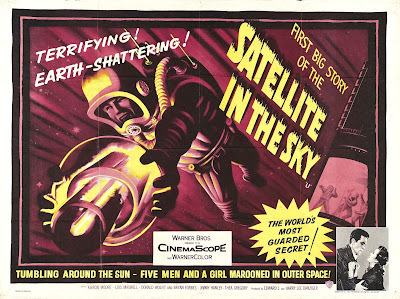 A lesser known 1950s British science fiction film with good production, solid acting and an intelligent script. 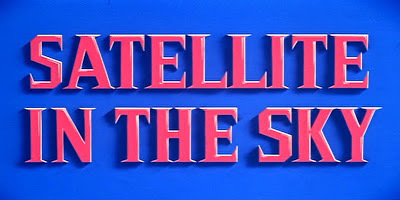 Satellite in the Sky is a less well-known 1956 British science fiction film directed by Paul Dickson. 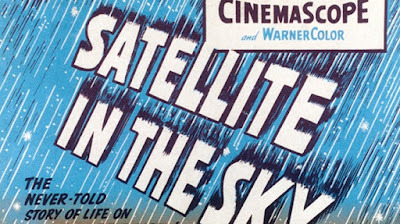 The film was the first British science fiction film to be shot in Cinemascope and WarnerColor. It is as if we are being led to believe that humanity’s entry into space is somehow predestined, that it is written in the very stars we will strive to reach. As if to reinforce this highly optimistic and uplifting view of our destiny, we are presented with shots of an Avro Vulcan bomber (“Mike’s plane”) - the pinnacle of human (British!) technology and ingenuity. After the plane lands, we are given sufficient time to feast our eyes on its sleek lines and overall sense of combined pride and power. (Damn! The plane even looks beautiful through 21st century eyes.) Throughout all of this show of technological brilliance, our emotions are given a stir from the uplifting and majestic music score by Albert Elms. While Cmdr. Michael Haydon arrives at the airfield in the Vulcan, we learn that a new rocket engine is being tested at the British Air force base, Thunder Hill where Lefty Blake and his colleague are supervising the 23rd test with a new fuel. 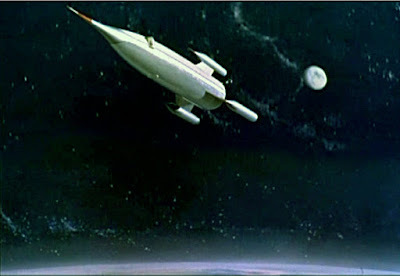 At a news conference / briefing held to discuss operation “Stardust,” (the first manned spaceship to orbit the Earth) Prof Blandford explains that in this supposedly “purely scientific” mission the craft is to be fired to a height of 1000 miles. Cmd Haydon is to be the chief test pilot and Larry Noble will be the navigator of the flight. Cmd Haydon will be taking a test flight up at 15.00 hours and he will fly to 50,000 feet to test the new engine. If the test is successful, the Stardust will be launched the next day. What will man have gained? Perhaps we should always ask such questions when we become overenthusiastic about scientific and technological breakthroughs such as for instance, the recent proposals to clone a woolly mammoth or T-rex dinosaur by using surviving DNA in retrieved blood samples! Do we do it just because we can? Why should we? Should we? What are the consequences? Kim Hamilton (along with many people these days) believes that there are enough problems here on Earth to concern ourselves with first before worrying about space. Haydon responds by declaring that space exploration is all about knowledge and the efforts to gain it. His argument is also held to be valid by many other people today who believe that such scientific endeavours as space exploration are important for increasing our understanding of ourselves and our place in the universe. A darker note is suddenly added to the philosophical discussion when the question is posed as to what potential the operation might have in time of war. Interestingly, a rather evasive and nervous response is all that is given. A bit of drama and tension is added during the aircraft test. As the plane descends it gets into trouble with the danger of possibly overshooting and failing to pull out of its dive. But have no fear as control is recovered at the last moment before the plane hits the ground. Despite the potential for failure, the power of technology and human ingenuity seem to reign triumphant! Hoorah! “Nice work Mike!” But why is it necessary to know where he will be on the night before the launch of Stardust scheduled for 10.00am the next day? HHHMMMMM! Kim: “What are they going to find up there that’s worth so much? Kim then asks Haydon to show her the Stardust. When they arrive at the hanger Hamilton stands transfixed at the sight and sheer size of the phallic-like craft. She utters the words, “I’ve never seen anything so overpowering, so beautiful.” Not only is she amazed by the beauty and power of the craft, but she also perceives the evil inherent in such power. As if it’s all too much to bear, Kim asks to leave and wonders if there is any point in trying to do something simply because it’s never been done before. As she leaves with Mike, Kim questions him about the guards stationed at the facility. Now why would you want to know that Kim? HHHHMMMM! Any hint of opposition or argument is met with by the cold hard fact that “it took millions to finance Stardust” and that most of the cost of the project had been met by the Americans. Therefore, the government has little choice but to following through with the bomb’s deployment. This overrides any concern about not giving the crew a chance to back out and keeping them in the dark as to the true purpose of the flight. In our own time, how many space missions and other scientific endeavours have been developed and presented to the public in the guise of beneficial scientific progress, while secretly concealing some other militaristic or surveillance function. Even something as basic as a satellite image can be used for either military weapons targeting or assessing the health of civilian crops. A great deal of current space technology is dual use in that it may have both civilian and military purposes, as well as offensive or defensive uses. 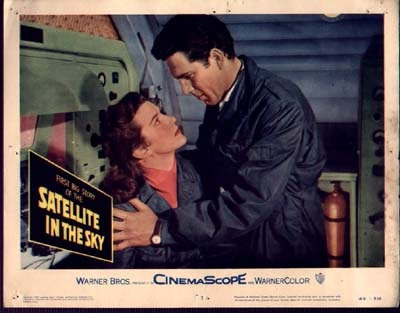 As in the film Satellite in the Sky, humanity has reached a stage whereby certain kinds of warfare may prove to be futile as was seen during the Cold War period when it was realized that so many powerful nuclear weapons were being produced that if used could destroy the planet many times over. We had arrived at the era of MAD: Mutually Assured Destruction. 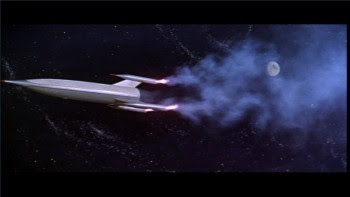 Returning to the events in the film, while the true purpose behind the Stardust mission was being revealed, certain events were being played out leading up to the launch of the space craft. Firstly, at the rocket installation, Kim Hamilton returns, manages to avoid a number of guards and sneaks aboard the ship as a stowaway. Now here’s a strong female character who is prepared to risk all and not just take no for an answer. It’s as if she’s the physical embodiment of the kind of ethical and moral concerns that should underpin human progress and as such she (and such concerns) are just not going to go away or be overlooked! Secondly, we have the juxtaposition of two subplots involving relationships: one taking off so to speak and one seemingly about to end. For instance, as Larry and Barbara are preparing to go out, the phone rings and Larry is informed that he is required back at the base. This is the final straw for Barbara and she tells Larry that their relationship is over, leaving the way open for that cad and bounder, Tony who soon takes an interest in her. On the other hand, we have brash bow tie Jimmy ringing his girl Ellen at the fashion show and proposing to her after initially being upset with her for having to cover a fashion show and cancelling their date. Thirdly back at the base a routine check has revealed that Kim Hamilton never handed her pass in but this is dismissed as being not important, despite it being the occasion of the first manned space flight in history! Not that long ago she’d be put through the process of rendition, spirited away to Guantanamo and water-boarded without trial! 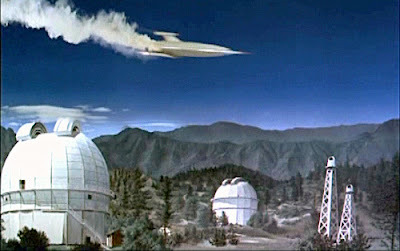 The ship lifts off using a ramp system somewhat like the old German V1 rockets and the ramp used in the film, When Worlds Collide (1951). Meanwhile back on board the ship, Haydon also reveals to the rest of the crew the real reason behind the mission, as well as for Merrity’s inclusion. Surprisingly no-one kicks up a fuss about this! The whole deceptive process would certainly get my dander up! As Merrity proceeds to check on the bomb, he discovers an unconscious Hamilton in a storage locker. The discovery of the stowaway prompts a wry remark from one of the crew that “it’s more like a bus service than a space ship.” The seriousness of the situation is made clear when Mike points out to Kim that “we might have been working on precise limits on the weight the ship can lift.” Yes, one might have thought so! At least in this film they bother to concede such an important factor. Hamilton is more than just an “attractive” female stowaway who makes coffee and “wiggles her hips” as Merrity might view her. She’s that moral and ethical reminder that just refuses to go away. 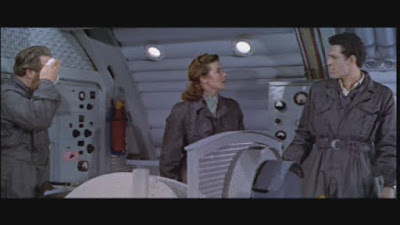 From her perspective, the mission amounts to just “dashing out into space before we’ve even thought about the problems we will have to meet.” She later elicits the following response from Jimmy, “I didn’t think much at all” about the bomb. From Lefty she receives the comment, “I’m just an engineer. If the bomb has to be exploded, this is the place to do it.” Complacency? Apathy? Naïve acceptance? Lack of engagement and critical understanding? They are certainly factors that help to explain how many problems the world faces today are allowed to continue. Hamilton tells Haydon she thinks the bomb initiative is a complete waste of scientific resources: “It’s a pity so much time, money and intelligence is wasted on building bigger and better bombs.” Still a profoundly relevant comment considering the proportion of GDP that is devoted to military endeavours by many nations in our own time. Hamilton learns that Haydon wants nothing to do with that part of the mission involving exploding the bomb. Nor does he want any part of the glory associated with it. It does however seem that he also does not want to accept any kind of responsibility. After all, he feels that exploding the bomb isn’t his job and that it is nothing to do with him. He believes that it would only be a matter of time until someone else took the Stardust up on another mission. Kim then challenges Merrity to take full responsibility for whatever might happen but he refuses and states that he is simply following the instructions of his superiors. Besides, according to him, “everything is taken into account.” Nothing like a dose of smug hubris! And so we have the kind of justifications put forward by both Haydon and Merrity explaining why each is not responsible for what might happen: Just following orders! Not my job! The world is indeed full of concentration camp guard types, minions and functionaries just following orders…..
After the bomb is released and its engines fire moving the device away from the ship, the rockets on the bomb suddenly fail and it drifts back towards the ship to which it stubbornly attaches itself. Even after firing the ship’s engines again in order to put distance between the ship and the T1 when it explodes, the crew discover that the bomb remains determinedly stuck to the ship and refuses to be dislodged. Lacking air resistance and gravity, magnetic attraction has caused the metal of the bomb to stick to the hull of the ship. The clock is ticking with only 9 hours for the crew to find a way to get clear of the blast! 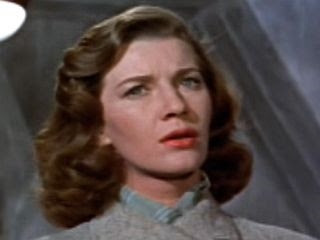 Back on earth, Barbara overhears a news broadcast announcing the dire situation in space and realizes that her husband may be in trouble, As she hangs up on that scoundrel Tony, Barbara may also be starting to realize just exactly what is important in her life. In orbit a moral and ethical choice needs to be made: To rectify the situation themselves possibly with Hayden going outside the ship and seeing what can be done with the bomb, Or, follow Merrity’s idea and land the craft in the Sahara desert. The decision is really made for them due to the nature of the bomb rendering it impossible for it to be detonated on Earth. Hayden leaves the ship and attempts to push the bomb clear, but once again it sticks to the ship’s hull. Hayden has no choice but to return to the ship. Meanwhile back on earth, certain moral and ethical decisions also need to be made. Here we witness via an overhead camera shot a meeting convened to discuss the options that could be tried save the crew and the mission. Although there is concern for the crew, it is a fact that there are “only six of them” as opposed to the millions on earth who would be impacted by the bomb. There is an idea to try and disconnect the primer but it is felt that this may accelerate the bomb’s detonation. One of the attendees concludes, “No gentlemen, I cannot see any hope.” It is therefore agreed to inform the crew that they are not to try and return to Earth. They are to stay up there in orbit. It appears that the needs of the many outweigh the needs of the few. Is the decision to sacrifice the 6 people on the ship acceptable? The one factor that often lies behind many disasters involving technology is evident in this crisis: the human factor. In this case, all the meticulous planning and the boastful confidence surrounding the T1 operation did not pick up on the likelihood that metal fatigue would cause the rockets to fail. People react to life and death situations in a variety of ways. Despite having everything to live for, Jimmy is oddly cheerful about the situation declaring, “Not everyone has a chance to go out the way we will.” Bravado disguising some other feeling perhaps? Merrity on the other hand, is beginning to lose it and he lunges at the controls in an attempt to fire the jets and try for a desert landing. After a vigorous slap-fest he is restrained by the crew. The choice seems to be rather stark: Start the jets and go for a landing (Merrity) or stay put (rest of the crew). But is it really just an “and / or” situation? On Earth, with only 4 hours left till detonation of the bomb, American advisor, Colonel Galloway tries to make contact with the US President to arrange a rescue mission. Coincidence or Fate? On board the ship, Hamilton explains to Hayden that her opposition to the Stardust program is based on the death of her brother who was killed while flying an experimental jet. She is angry because Hayden’s attitude reminds her of her brother’s attitude. It also turns out that her father was killed testing rocket fuel as part of his quest to find the right kind of fuel. Lo and behold! Hamilton is the daughter of the man who made the fuel that made the Stardust mission a reality! What are the odds! In the brief period of time left, we see alternating moments of resignation and hope. Now that the end seems imminent, Lefty’s final assessment is that he is happy as he has managed to achieve what he wanted to. Jimmy feels that just as he has reached a point of being happy in his life, it is now cut short. Larry?….well….he was once happy. Unknown to the others, Lefty and a transformed Merrity decide to leave the ship and see what they can do with the bomb. Meanwhile, out of the ashes of tragedy hope rises triumphant. A sentiment highlighted as Haydon declares his love for Hamilton and asks her if she would she have married him, and she replies that she would and then they kiss. The rest of the crew soon realize what Merrity and Lefty are doing but can only watch helplessly as the two men attempt to defuse the bomb. However, they are unable to do so as the fuse is too badly damaged. …..Or between the two men and the crew as Haydon quickly orders the ship’s engines to be fired. After a brief bit of drama involving an open airlock, the engines are fired and Stardust pulls away from the bomb and its two brave custodians.